Nancy Lee Martin was born in Fluvanna County, Virginia and currently lives in Mechanicsville, Virginia. A member of Broadus Memorial Baptist Church, Nancy Lee is a widow who was married for 31 years. A Wachovia Bank retiree, Nancy Lee was previously a buyer for Miller & Rhoads Department Stores before she began her banking career. After attending the University of Richmond, she attended Rescue College and also completed many management classes. Nancy Lee is a Life Member of East Hanover Volunteer Rescue Squad, where she has held many positions over the past 18 years, including an EMT-B, Cardiac-Tech and Ambulance driver. Currently serving as a dispatcher, she trains and oversees new dispatchers, as well as serving on the Membership Committee. Nancy Lee is a life member and current President of the East Hanover Volunteer Rescue Squad, Auxiliary, (for the 5th time in 10 years). She has served at the state level as the Virginia Association of Volunteer Rescue Squadís Southeastern District Vice President for 2 years, member of the 50th anniversary committee as secretary, Southeastern assistant District Vice President, District Parliamentarian, plus served on many other committees at the district level and in her Auxiliary through the years. Currently, Nancy Lee is the treasurer of Pamunkey River Garden Club and the junior past president. She also serves as publicity chairman for the Piedmont District; Virginia Federation of Garden Clubs, Inc., liaison to the ìFine Arts and Flowersî; Chairman of Publicity for the V.F.G.C. Inc, 2007 convention; student flower show judge; landscape design consultant; and First Vice President of the Richmond Council of Garden Clubs. Previously, Nancy Lee served as Grand officer, (Grand Ruth) for the Order of the Eastern Star of Virginia; past Grand Representative of Manitoba in Virginia from 2000-2002; past matron of Glen Allen Chapter #61, serving currently as an officer; and past matron of Mechanicsville Chapter #138, currently their secretary. Nancy Lee also served as Chairman of the Decorating Committee for the 100th anniversary of the order of the Eastern Star Convention in 2004. A member of the William Byrd Chapter of the Daughters of the American Revolution, Nancy Lee is currently serving on various DAR committees. Nancy Lee is a member of both the Genealogical Research Institute of Virginia and the Fluvanna County Historical Society. She is also a member of the Richmond-East VA Chapter 1543 Moose. Nancy Lee was a member of "The Sonlighterís," a Gospel Blue Grass Band for 3-1/2 years, playing the guitar and Dobro and singing. In 2005, she helped form a group called ìComes from the Heartî, which currently performs as a non-profit group, visiting senior groups, nursing homes and adult day care facilities, entertaining and sharing her talents with others. Nancy Lee loves singing, playing her guitar or dobro, and jamming in the Richmond area. She believes in giving back to the community, whether it is by volunteering her time with organizations or sharing her talents with others by visiting nursing homes and other senior groups. Nancy Leeís special hobbies are gardening, genealogy research, putting on shows, playing music, singing, reading, bowling, and especially visiting with family and friends. She collects old cookbooks and many friends and loves to shop. As you can see, Nancy Lee likes to stay busy. 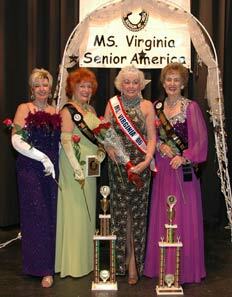 From left to right: Betty Mann, Richmond, 3rd runner up; Suzi Athanas, Virginia Beach, 2nd runner up; Nancy Lee Martin, MVSA 2006 from Mechanicsville and Gladys Bowles, Richmond, 1st runner up.